Welcome to our 2007 Christmas Newsletter. We hope that this newsletter finds you well and in high Christmas Spirits. This edition of the Judith & Kathryn Newsletter contains a number of new kits, as well as our personal reflections on the past few months. We wish you and your family best wishes for Christmas and New Year. This romantic kit would make an ideal gift and is suitable for beginners. 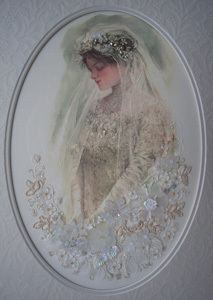 The kit contains silk print, all beads and coloured embroidery threads, lace and pearls, picture and instructions. Angelic Pocket is made using the Angel with Bells print, lace and beads. 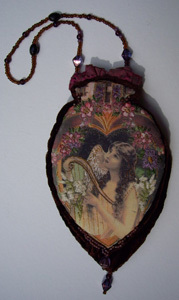 Jewellery Pouch is made made using the Angel and Harp print combined with exquisite shot crushed velvet and beads. 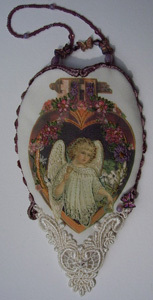 Needlecase is made using the Angels with Music print, heart shaped felt page, fabric and beads. Namesake is made using the Angel with Birds print, backing fabric and beads. A lovely gift for the Christmas tree or a child's door. This kit can be personalised and any print from the range is suitable. This pretty slip-on cover can be made to fit an album of your choice. 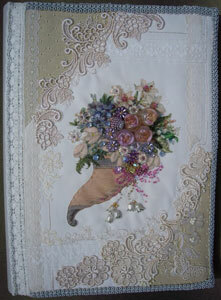 The kit contains silk print, laces, fabrics, embroidery threads and beads, picture and instructions. Needle, interfacing, pellon and beading thread are not included. 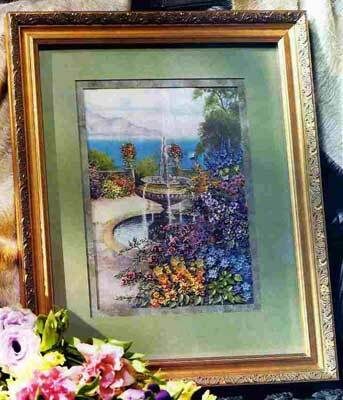 Another new kit �La Fountaine� which was published in the latest �Country Craft and Decorating� magazine Vol 19 No1. Looking for a Christmas Project? Try Typing Santa into our sites search engine or click the link below and browse through the available prints! Another business highlight of the year was teaching a class again in Sapporo in Japan, after attending a wonderful wedding of the daughter of our close Japanese friends. Rumiko, the mum, is now living with us for three months to improve her English. She is a wonderful cook and insists on doing most of the cooking, much to everyone�s delight. 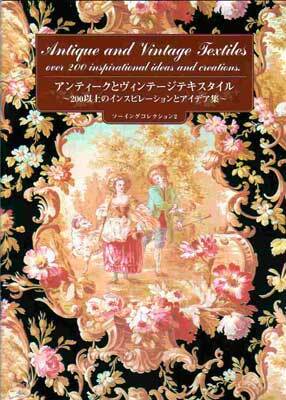 by Toshiko Powers called �Antique and Vintage Textiles�. It is available for AUD$20 + p&p. Wishing you peace and joy as you celebrate the real meaning of Christmas with your loved ones. This year has flown by with all the excitement of our daughter-in-law's art exhibition at Tin Kat Cafe in Adelaide, many family events and the birth of our first little grandchild, who is now 4 months old and a regular visitor to our home. I'm happy that I have found time to create more new projects which are now on our website and I hope you enjoy seeing them. I wish all of our customers a peaceful and joyous Christmas and hope that you will all have a very special family time together.